Photograph by Matthew Owen and Shane Pequignot for Annie's. Used with permission. How would you like suggestions for two quilts you can make in one day? I designed the first one, Paint Chips (above), using Riley Blake Designs' Meow collection: it measures 41-3/4" x 54-1/2" with blocks that finish at 8-3/4". 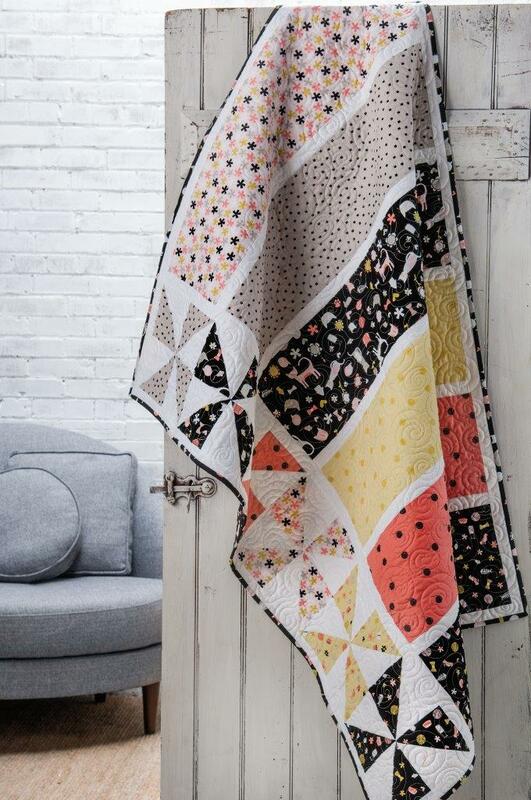 You can see the fabrics in all their glory in this quilt, a perfect quick handmade gift for a loved one! Melissa from Sew Shabby Quilting contributed fun texture to this project and it has been placed in front of my office door so I can enjoy the whimsical prints and simplicity of its design. This quilt is ideal for when you want to make a handmade gift but has very little time. Also, if you know someone will love a particular fabric line, why not restrain from cutting those fabrics into tiny pieces? My second choice for you: English Garden, another of my designs which you can make in only one day. It measures 50" square and the blocks finish at 10". The fabrics are from Riley Blake Designs' collection Sweet Prairie. I love the floral texture that Melissa added to this quilt, echoing the tossed flowers featured on the prints. Both these quilts are large enough to be used as lap quilts, although English Garden would make a fun table topper. You can find the pattern for Paint Chips and English Garden in Quilter's World Quilts You Can Make in a Day pages 54 and 57. 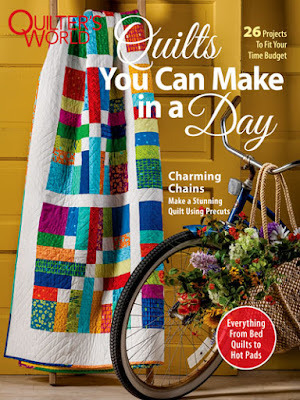 You will love this publication as it features 26 amazing quilted projects you can whip up quickly. In addition to my quilts, you will find table runners, wall hangings, throws, baby and bed quilts... Get ready to sew! I hope I have just given you enough inspiration for a very productive quilty week. Enjoy it! Sweet quilts in those adorable prints by RBD! 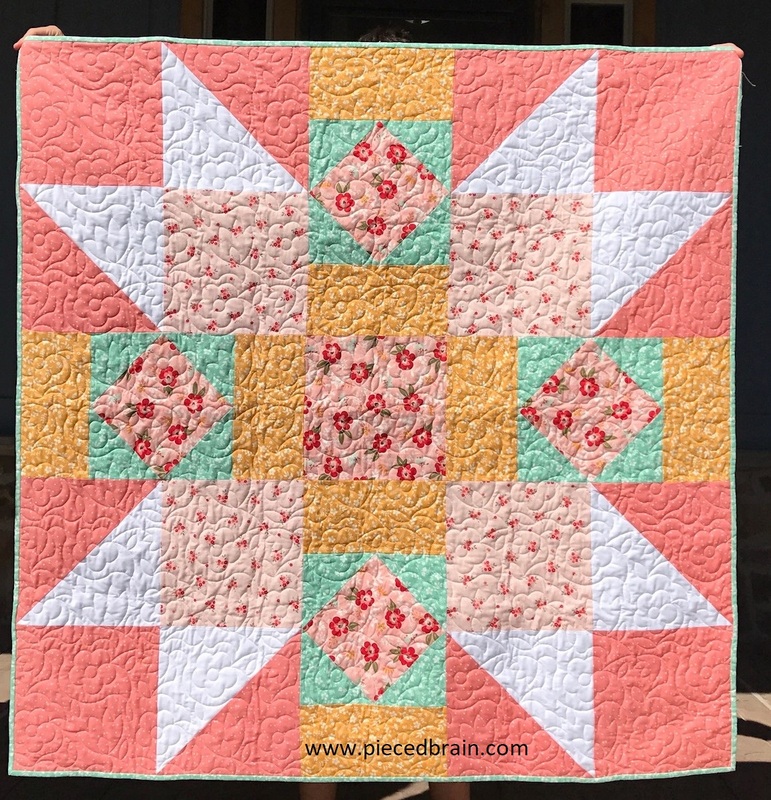 The quilting is so pretty, too! You can't possible be as slow as I am! Seriously, I can't sew or press fabrics and blocks fast. I bet you can make them in a day (put that phone away!) :-). I love the Paint Chips !! I know, right! It is like the colors ran from the pinwheels as they turned! Hello Denise! 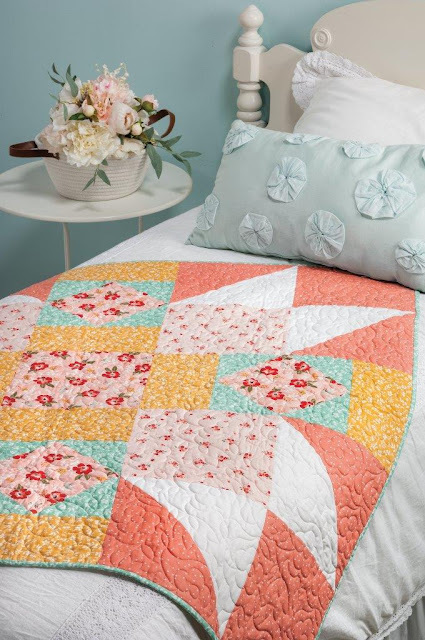 Thank you for sharing both of these fabulous quilts! I make quilts for Project Linus and although, I usually try and make very detailed quilts. Occasionally, I like to make something that is big and bold and just as beautiful. As quilters, our moods, the weather and so many other items play with what we are in the mood to create as much as the pattern and materials. So thank you so much for sharing both of your fantastic quilts! Have a fantastic day! I am so glad you liked! You are correct, so many things affect what we choose to play with. No wonder we always have a few projects at different stages of completion. It is the same with quilt design! Those look like fun quilts. Both lovely!.. I am going to try to find the Meow collection. My daughter is a cat lover!